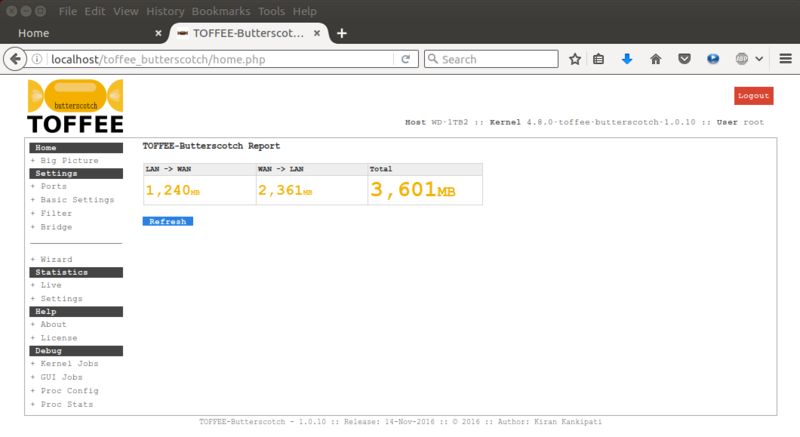 Here is my second software development update of TOFFEE-Butterscotch. In the previous update (28-Oct-2016) I discussed about the Alerts, etc. You can read the complete article HERE. Whereas in my first TOFFEE-Butterscotch news update I have introduced about TOFFEE-Butterscotch research, project specifications, use-cases, etc. 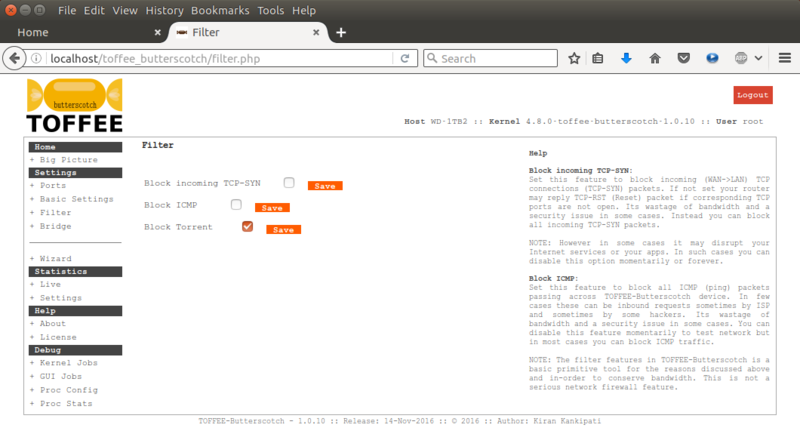 Filter :: Block Torrent: You can now block selective torrent packets with the new block torrent feature under TOFFEE-Butterscotch Filter as shown below. If torrent packets are blocked(dropped), the same is notified in the home page as alerts as shown below. NOTE: The Alert count will be reset (and hidden) if block torrent feature is disabled. 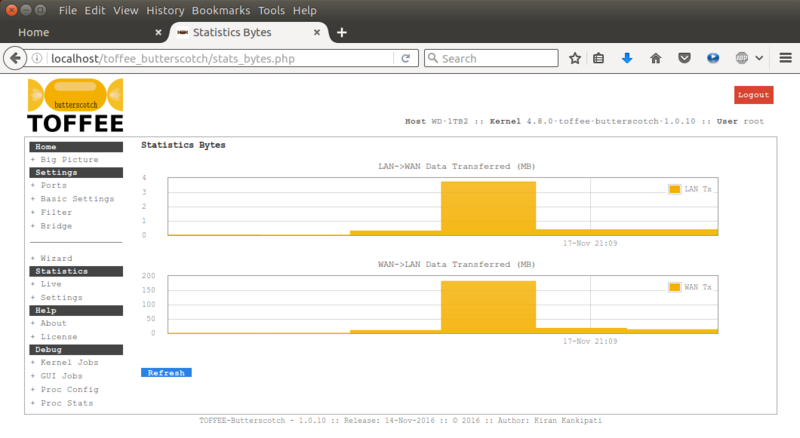 Throttle Torrent: So far you can only Throttle TCP packets (includes all TCP application layer protocol packets). But from now you can also throttle other application protocol packets. For instance in this case Torrent packets. 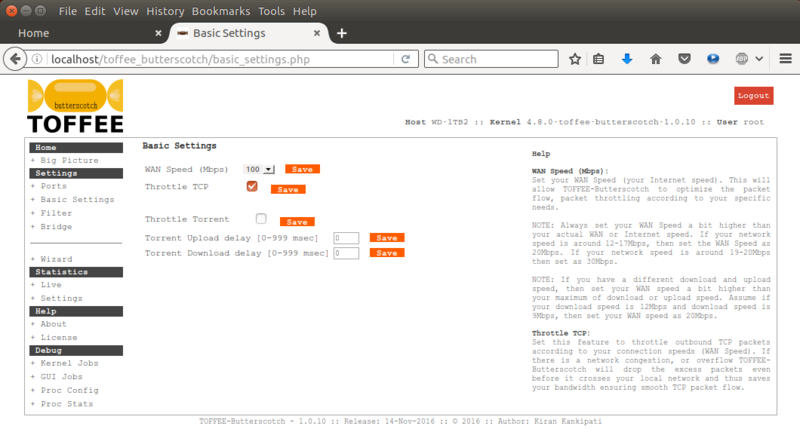 You can introduce directly inter-packet delay (upload and or download) and control the rate of these packets precisely. As long as you are using your home/SOHO internet all by yourself it is not that important to rate-limit Torrent traffic. But in case if you are sharing your connection with your family members or your employees(or colleagues) then this feature will slow down torrent traffic and on the other-hand prioritizes other important interactive traffic. If you are playing games or using your Internet for other purposes simultaneously while downloading large files via Torrent, then this feature will be quite useful so that the torrent traffic will not slowdown your basic Internet access. 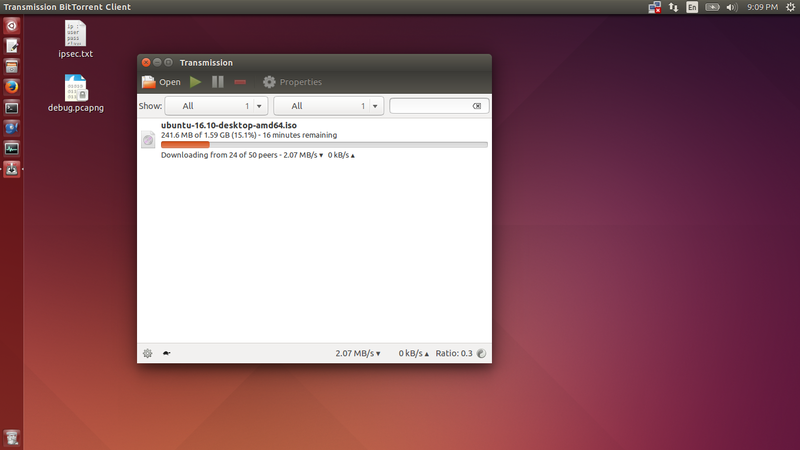 Here is my test HP laptop in which I am downloading a sample Ubuntu OS distro via torrent. 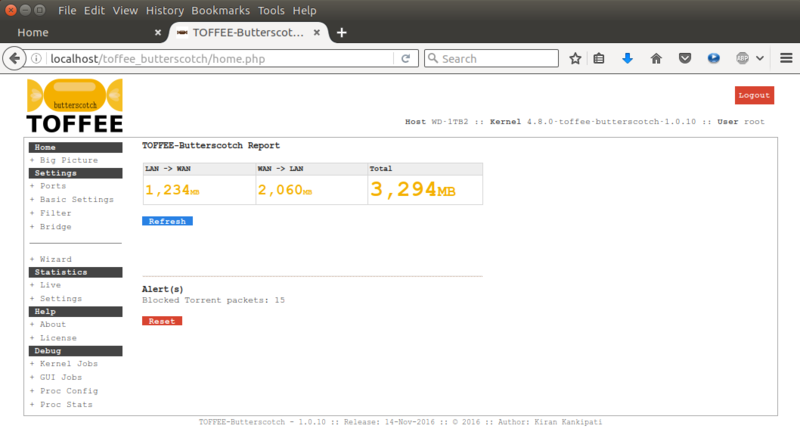 In this case the Throttle torrent is disabled in TOFFEE-Butterscotch as you can see above. And this is the peak speed at which I can able to download this torrent.